ZurichA casual meeting space at one of global insurance company Zurich's offices. In an effort to maximize productivity and happiness, global insurance company Zurich is letting its employees determine what its new North American headquarters will look like. Last fall, 150 staffers participated in a pilot program in which they tested out different workspaces and reported which design features they liked best. The best-liked features will appear in the new HQ in Schaumburg, Illinois, when it opens in fall 2016.Employee feedback suggested the current Schaumburg office, which features a traditional mix of private offices and cubicles, wasn't meeting their needs. So Zurich partnered with Cannon Design to create a workspace where employees could really thrive. Zurich and Cannon analyzed the data from the pilot program and found that certain features were near-universally applauded as being conducive to productivity and well-being, while others were seen as obstacles to getting things done. Employees did not like casual furniture: Any furniture that was too casual — think a couch or a table with chairs that you'd see in a home — was not seen favorably. Instead, it was viewed as a hindrance to the ability to get work done. This was true for all generations of employees, despite the common misconception that millennials prefer more casual workspaces, Osman said. Employees wanted more social hubs: These spaces include a kitchen and an area for eating together or chatting, separate from areas designated for working. Employees liked having an area of respite, where their chatter or the smell of their tuna sandwiches wouldn't distract their colleagues doing serious work. 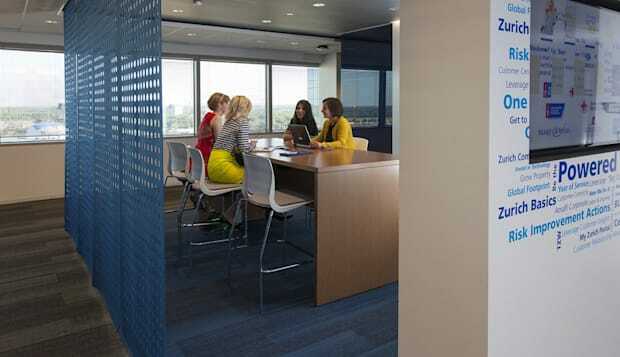 Employees appreciated private enclaves: These are private spaces designed for individual, "in-the-zone" work. People can also use these areas for conference calls or small meetings. Employees liked having a balance of spaces for collaboration and individual work. Employees loved natural light: In the new HQ, there will be views of nature and as much natural light as possible. Employees wanted sit/stand desks: With these workstations, you can push a button to vary the height of your desk so that you can either sit or stand while working. The many employees who used these mechanisms said that when they varied their posture, they worked more efficiently.